ANTi is a Super Smash Bros. 4 Mario and Zero Suit Samus main with a strong Cloud secondary from Manhattan, New York who is currently residing in Copiague, New York. He is currently considered to be the best Mario player in the world. He is well known for his extensive character roster, and regularly employs counter-picking in tournament to secure more advantageous match-ups. He notably won CEO 2016 and was considered a top 10 player in 2015 and 2016. 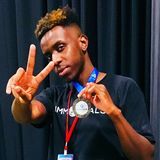 ANTi is currently ranked 2nd on the New York Smash 4 Power Rankings and 14th on Panda Global Rankings 100. In Brawl, ANTi was a Meta Knight player, and was considered one of the best Meta Knight players in the world. He was well known, much like in Smash 4, for his significant character pool. ANTi is currently ranked 7th on the 2016-2017 SSBBRank and was ranked 5th on the final Tristate Brawl Power Rankings. He is the 8th player to take a set off of ZeRo, the 4th to eliminate him, and the 2nd to defeat him in a Best of 5 without losing a single game, doing so at WNF 2.5. On June 22nd, 2016, both ANTi and Dabuz were signed by Dream Team. On August 22nd, amidst allegations of mispayment, ANTi and Dream Team would part ways. On September 13th, ANTi was signed by Immortals. Nearly two years later, on September 10th, 2018, ANTi announced his departure from Immortals. ANTi's tag is derived from a website, the name of which he can't recall. ANTi specialises in utilising Meta Knight's effective tilt game. He will typically string single hits of tilts together, which further combo into different moves, which he determines based on his opponent's percent. He is reputedly known for having among the best matchup knowledge of all players in Brawl against many characters, such as Olimar and Diddy Kong, to the extent that other top professionals, such as Mew2King and Ally used to study his matches closely to implement his strategies into their own plans during the Brawl days. ANTi's playstyle focuses on his exceptional capability to manifest and maintain pressure situations, being especially proficient at following his opponent's movement, retreating, and defensive options. In doing so, this enables him access to his unique form of aerial and ground based movement pressure, often running circles or tomahawk jumping around his opponents. These pressure microcosms he establishes provide him the ability to pressure his opponents into reacting, allowing him to punish when they overextend. ANTi is adept at following his opponent's aerial drift, allowing him to react and cover landing options, pressure from below, or extend juggling situations. ANTi is very perceptive of airdodge and shield habits, and will exploit them to extend combos, obtain grabs, or kill. ANTi's legendary entrance at CEO 2016. ANTi is recognised for his vibrant and brash personality, most evidenced by his social media presence, and in his CEO 2016 Top 8 entrance. He is prominent for introducing several trademark phrases and memes to the scene. For instance, he and fellow Mario player Ally jokingly claim that Mario is not a good character, despite their prominent tournament success. His usage of phrases such as "lavish" and "OD" have become fairly common throughout the community, as has his usage of "Jims," to derogatorily refer to those in the community without social etiquette. Moreover, ANTi and Ally being known as one of the two best Mario mains in the world. Ally usually wins the Mario mirror match aganist ANTi. At Canada Cup 2018, ANTi managed to take a set off of Ally in the mirror match, the last time ANTi took a set off of Ally was at Shots Fired 2, which was almost 3 years ago. ANTi is frequently known to enter Street Fighter events, and to pay close attention to their scene. 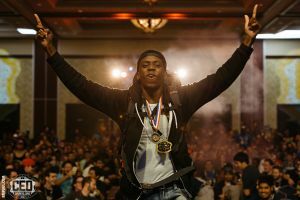 He famously defeated Street Fighter player LOWTI3RGOD in multiple online sets, including a perfect round, after the latter claimed that a Smash player would never beat him in Street Fighter. ↑ Dabuz and ANTi join Dream Team. ↑ Dream Team fails to pay ANTi, Dabuz and HugS on time. ↑ ANTi announces departure from Dream Team. ↑ ANTi announces his departure from Immortals. ↑ ANTi is confident that he could go pro at Street Fighter 5 if he wanted to, given time; offers to be trained by Arturo, Bum, and Alucard. ↑ ANTi's entrance at CEO 2016. This page was last edited on March 17, 2019, at 03:30.